Today’s program idea: Building a tower. Every year, someone in the local club is either putting up or taking down a tower. It is a special time, of course, but also a great way to document how good construction, or de-construction, is done. Have someone with a camera be the documentation person for the construction of the tower. Sure, they can help with the tower construction itself, but the most important role for this person is to document how construction is done. Then, the tower owner can provide a program that shows the various construction details — with pictures — on how this tower was built. 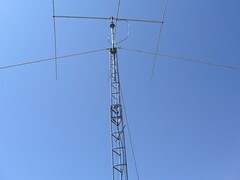 A great example is the HD-70 tower construction, delivered instead to the local club. @Pat NØHR – Pat — wonderful pictures. These pictures are the type that can be readily used in a Club program. And a reminder that putting up a tower and antennas requires a lot of work and planning. Nice going.